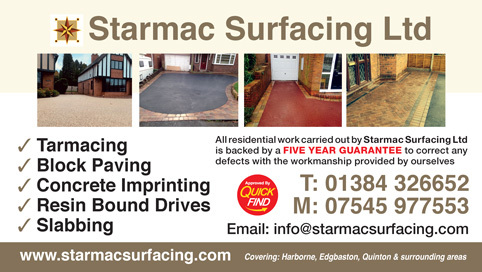 Starmac Surfacing Ltd, based in Dudley, was established early in 2014 and offer both residential and commercial work. Starmac Surfacing Ltd provide specialist tradesmen, such as block-pavers, tarmacers and civil engineers, together they have an abundance of expertise and specialist skills, some with an impressive 20 years of individual experience in the surfacing trade. A Quick Find Directories vetted and recommended local trusted trader in Halesowen, Stourbridge, Cradley Heath, Harborne, Edgbaston, Quinton and surrounding areas. "Amazing new driveway Just had a new driveway completed by Starmac. The team were professional and polite. The drive looks amazing and just how we wanted it. Would definitely recommend this company."